Today a new DIY, a ring inspired by CHANEL. I fell in love with it and I decided to create my own DIY, also using recycled stuff, but now let's go to the tutorial. ESSENTIAL: cork cap, utility knife, aluminium film for food, ring base, adhesive pearls, glue and hot glue. TUTORIAL: I first cut the cork cap in half, then I created a cube which I then covered with aluminium foil blocking it with a bit of glue. I then covered 5 sides of my cube with of the adhesive pearls, and finally I glued the free side with hot glue to the base of the ring. What do you say, isn't easy and cute? ... I can't wait to wear it! Oggi un nuovo DIY, l'anello ispirato a CHANEL. 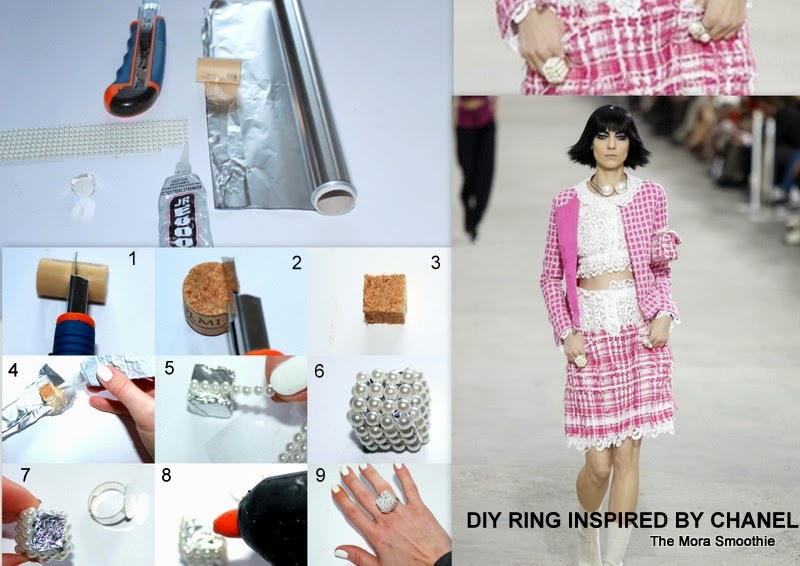 Avevo visto quest'anello al dito delle modelle durante la sfilata CHANEL primavera estate 2014, me ne sono innamorata ed ho deciso di creare un mio DIY, usando anche del materiale di riciclo, ma ora passiamo subito al tutorial. NECESSARIO: tappo di sughero, taglierino, pellicola di alluminio per alimenti, base anello, perle adesive, colla e colla a caldo. TUTORIAL: ho prima tagliato il tappo a metà, poi ho creato un cubo che ho poi ricoperto con la pellicola di alluminio bloccandola con un pò di colla. Ho poi ricoperto 5 lati del mio cubo con le perle adesive, ed infine il lato libero l'ho incollato con della colla a caldo alla base dell'anello. Che ne dite, non è semplice e carino?...non vedo l'ora di indossarlo! Beautifully done. Your photographs make it look very easy but am sure it must have taken a lot of time and patience. ma è venuto stupendo questo anello! however does default official source to smooth 60 fps procedure with 1080p streams. official guide For playback of DRM-protected UHD video clips, open a TV that is compatible with the visit HDMI 2.0 as well as HDCP 2.2 criteria is link required.